15-month demotion, is less than his reward  a three-year, seven-month paid vacation. Positive media to the contrary, this shows how B.C.s Office of the Police Complaint Commissioner really works. Unless a case gets advance publicity, support from an influential group or caught on video, the OPCC rationalizes, condones or even covers up misconduct and criminal actions by police. Thats demonstrated by the contrast between two stories reported on Feb. 10  the widely publicized Yao Wei Wu case and the little-known Sukhwinder Vinnie Singh Dosanjh case. The same principle applies to the way the OPCC handled Vancouver police constable Taylor Robinsons assault on a handicapped woman. Yet the BC Liberal government has granted the OPCC power to investigate the new Independent Investigations Office. Police complaint commissioner Stan T. Lowe and his deputy, Rollie Woods, are now posing as crusaders for justice following the OPCCs Feb. 10 decision to appeal a B.C. Supreme Court order. The court cancelled a public hearing into Yao Wei Wus beating by VPD constables Bryan London and Nicholas Florkow. But did the OPCCs appeal result from principle or publicity? The Wu case received widespread media ever since the Vancouver daily Ming Pao broke the story on Jan. 21, 2010. The Sukhwinder Vinnie Dosanjh case, by contrast, was kept secret by New Westminster Police, Port Moody Police and the OPCC for more than three months following Dosanjhs suspension from the New West force. Dosanjh was suspended pending an investigation into an off-duty Port Moody incident in which he illegally entered a womans house and assaulted her. Dosanjhs suspension took place July 28, 2008, but the media didnt learn about it until Nov. 3, 2008. Three days of news stories followed, then the media lost track of the case until last Feb. 10. On that day New Westminsters Royal City Record reported that Dosanjh had returned to work following a three-year, seven-month paid suspension. The Record apparently discovered that despite the lack of any public announcement from New West Police or the OPCC. The Record stated that Crown attorneys had dropped all charges against Dosanjh. Even so, a judge was so concerned that he took the unusual step of imposing a peace bond with a number of conditions. Dosanjh was to report to a probation officer, have no contact with the woman he assaulted and possess no weapons outside his police work. The Record also revealed that Dosanjh faced additional allegations, including an off-duty firearms offence, which were investigated under the Police Act but not under the Criminal Code. 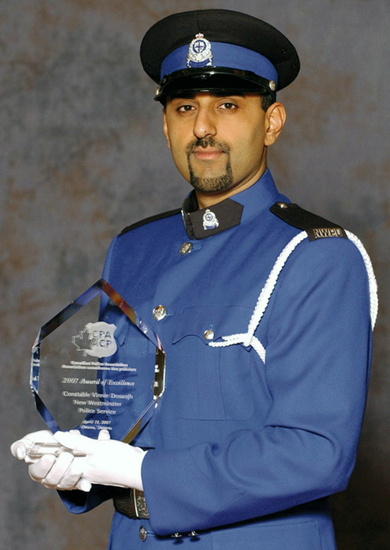 Despite admitting to very serious charges, Dosanjh was allowed to return to the force. His only penalty is a temporary (15-month) reduction in rank to second-class constable, a minor inconvenience following his nearly four-year vacation. He has also been ordered to undergo psychological treatment. force for its supposed transparency, discipline and accountability. Sukhwinder Vinnie Singh Dosanjhs multiple offences. The remark isnt surprising, given that Woods is a brazen liar. There are several disturbing questions about the OPCCs handling of the Dosanjh case. Why didnt the OPCC object to the extremely slow conduct of the Police Act investigation? Justice delayed is justice denied. Why didnt the OPCC object to Dosanjhs nearly four-year paid vacation? Dosanjh actually profited from his criminal actions. 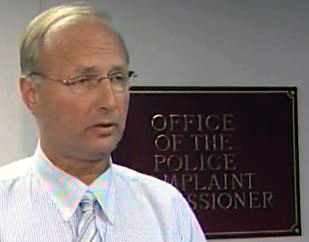 Why didn’t Lowe call a public hearing following the cops’ excessively generous Dosanjh decision? New West police sergeant Diana McDanie told the Record that the OPCC signed off on the cop-on-cop investigation. As of Feb. 18, at least two weeks after Dosanjh returned to work, the OPCC had made no public statement on the subject. The OPCC did promptly issue a Feb. 10 media release about its Wu appeal, an action which would appear to cast the OPCC in a positive light. Exactly what did the OPCC sign off on, and why? How does the OPCC justify Dosanjhs return to the force when he admits to charges that reflect very poorly on his suitability for work involving weapons and use of force? Why did deputy police complaint commissioner Rollie Woods praise New Westminster police at the same time that this secret investigation was dragging on? How does this file reflect on the OPCCs handling of other cases that fail to get sufficient media coverage, support from an influential group or caught on video? And a question for B.C.s minister of justice and attorney general Shirley Bond: Why was the OPCC granted investigative authority over the new Independent Investigations Office when the OPCC itself lacks transparency and integrity? Additionally, the Wu/Dosanjh contrast brings to mind the way the OPCC handled Vancouver police constable Taylor Robinsons assault on a handicapped woman. Theres no credible indication that any investigation took place before the week of July 22, when the media learned about the assault. Citizens have no way of holding the OPCC accountable. The agency answers to no one  not the provincial ombudsperson or anyone else. An independent investigation by someone like Ontario ombudsman Andre Marin (who has twice investigated that provinces Special Investigations Unit) would cause a scandal. Lowe heads a secretive agency whose senior positions are staffed exclusively by ex-cops and people very close to the cops. The OPCCs staff, hiring policy and decisions get almost no scrutiny from any source  almost none from the mainstream media and absolutely none from the provincial ombudsperson, the BC Liberal government, the NDP opposition and the BCCLA (who are the establishment-approved official activists on police issues). No transparency, no accountability, no integrity  but Stan Lowe and his crew of ex-cops will hold investigative authority over Richard Rosenthal and B.C.s Independent Investigations Office.